In the meantime, if any economist friends think I’m going over to the dark side, in taking anthropology seriously, please do not worry; I think anthropologists need to take economics seriously as much as the other way round. I’ve long had a rather dismissive attitude to what I called here anthropological thinking, contrasting it with evidence based thought. Thinking back, I can date it to when, obviously have heard of initiation ceremonies somewhere, I used the term in reporting back to my parents about the first time I went to cub scouts. Seeing a new boy, the others shut me in a lock up garage, but I could see this was just about testing me out, seeing whether I would cry, so I just waited until they let me out, and enjoyed being a cub scout thereafter. Of course that’s no reason to dismiss anthropology as such, a subject whose standing, in my eyes, rose with Gillian Tett attributing her training as a social anthropologist to being able to cut through the myth of bankers’ pre-crash economic rationality. But I still struggle with those who like to hold up potlatches and other examples of gift economy as somehow undermining the value of mutually agreed exchanges between individuals, and thereby modern economic systems. Of course I enjoy unwrapping my Christmas presents, and the emotional involvement of thinking what those I care for would like to receive as a gift from me, but I don’t reject the whole system of contracts which underlie my life as economic man. And this Christmas, a complete surprise, I was giving a big solid book of anthropology. I never realised it could be this good. As admitted elsewhere, there were times, in reading of successive neolithic cultures spreading across Eurasia, that I fell asleep, but this was just giving necessary detail for others, more learned than me, to assess the strengh of the arguments. What mattered for me was the commitment to evidence. 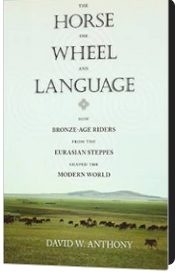 Leaving aside the methodology, the book, as the cover says, is about “How Bronze-Age Riders from the Eurasian Steppes Shaped the Modern World”. As such it stakes a claim to the attention of all of us who look for modern origin myths – would-be scientific explanations of who we are in terms of where we have come from. The author is well aware of this, and in the early chapters on what modern linguistics can tell us about the development of Indo-European languages, and hence Proto-Indo-European society, he mentions the most notorious of such myths; the sad search for an Indo-European homeland, following the 19th century discovery of common roots of Indo-European languages, and hence a pure original source of supposed inherent Aryan identity. A joy of this book is that the author does not shy away from the science, and uses it also to reject counter myths such as that there never was a Proto-Indo-European society, or, more kindly, that there was, and its agressive warriors cruelly snuffed out a more humane, matriarchal society that existed in Europe previously. There were elements of that, but it was more complicated, and from knowing that these complications have been studied, I find myself wanting to look again at Homer and other Greek myth; it also might help make sense of Robert Graves’ “The White Goddess”, although that may be asking too much. Another joy comes from the incidental details, which take the immagination to a world of so long ago, that a group, for whatever reason, could make their way thousands of miles east across the steppes to end up somewhere now part of China, but at the time probably uninhabited by humans. Elsewhere, on the forested northern edges of the steppes, there were people hunting now extinct Aurochs, and gathering species chenopodium and amaranthus, whose seeds apparently give just as much food value as early types of wheat, and still grow unbidden on my allotment. Better them than an unbidden Auroch. I think what sort of reason might have driven these peoples is the heart of anthropology, so making it about what humans are like, in the same way as some other social sciences – psychology, sociology – and aspects of natural sciences, e.g. biologists looking for genetic determinants of behaviour. It’s also the subject matter of religous doctrine, such as the idea of Original Sin, or conversely New Age ideas that we all contain some element of a World Spirit. Its bearing on economics is interesting, since a view accepted in the book is that moralities evolved to suit material and technological circumstances, and the author comments on the irony that his American approach along these lines was distinctly more Marxist than the former Soviet anthropologists and archaeologists whose work he was bringing into the mainstream. He also discusses the role of demand for commodities, such as turquoise, breeding horses and tin in that ancient world, making economics of a sort one part of what is covered by anthropology as he sees it – and as Gillian Tett covers well today. What distinguishes it from today’s mainstream economics, however, is that it has a richer idea of what humans are like than the utility maximisation of the mythical economic man. Up to a point, I go along with the idea of utility maximisation, and if, in the way of an evolutionary biologist you identify utility with increased chances of genes being replicated, then it has had some undeniable long term explanatory power. It’s just that there is much more to be said about how humans are than this abstract simplification, and that as individuals, we can do better than just concern ourselves with how many of our genes we pass on the future generations, or how highly we rank on a felicific calculus, which is likely to degenerate into looking at personal net worth. Instead, the author sees humans as having a range of drivers such as status goods, appreciation of praise (there’s lots about the role of praise poetry such as found in Homer), and participation in culture more generally, in addition to basic material needs – such as chenopodium and amaranthus. With a different evidence base, it is like behavioural economics, which looks to psychological experiments to provide the richer account of how humans are than assumed in mainstream economics, without negating the core of that subject. Another detail, maybe more than incidental, since its consequences are so profound, is that the amount of genetic variation on the Y chromosome of the horse is so low that the ‘equine Adam’ must have lived quite recently – and on the basis of the other evidence in this book, almost certainly arose from Proto Indo-Europeans picking up a single stallion mutation which made it tractable enough to ride, and thenceforth controlled breeding from it, giving them animals not only to ride themselves, but to trade. Now all Equus caballus are domesticated thanks to their efforts, their wild cousins’ offspring, like the Auroch, hunted to extinction. The world view which can take on board such facts may be richer than mainstream economics, but it doesn’t necessarily make what happens the less a matter of impersonal economic, technological and in this case genetic forces. So no place for stories of either Gods or Goddesses, other than myths to be analysed – and maybe off professional duty, hopefully enjoyed. I was also struck by the use made of anthropology applied to recent historic period societies – such as the indigenous peoples of America – and even the waves of settlement in the US from the British Isles. They provide an evidence base of which I’d never thought, about how people behave, and how this causes societies to develop. He also uses demographic studies of how people scout out place to move to, and pass back the information to friends and family, to identify how movements of people actually occur – e.g. not just by warfare. Having finished the book, I googled a bit about anthropology, and found myself reading about Franz Boas, a name I’d been aware of, but little more. Seems like a cool guy – with a background in physics, taking from it it seems, in developing anthropology, not that unrestrained yearning for theories of everything, but insistence on evidence. So he became one of the leading opponents of then popular ideas of so called scientific racism. He also saw the subject as comprising four sub-fields of Archaeology, Linguistics, Physical Anthropology and Cultural anthropology, which, on reflection, covers this book well. Apparently with “increasing … specialization linguistics and archaeology came to be regarded largely as separate disciplines”, something which the author regrets in his early chapters on linguistics, commenting that those outside the subject resist the force of its conclusions. If also now “physical anthropologists often collaborate closer with biology and medicine than with cultural anthropology”, I wonder if that leaves a residue of cultural anthropologists in a self enclosed world, a bit like neo-classical economists, only accepting their own ideas of what matters. Apparently Gillian Tett has described academic anthropology as committing “intellectual suicide” – but the link on the Wikipedia page is broken, so I can’t say why she thinks this. But I’ll guess it’s something along these lines – failing to look at all relevant evidence when studying humanity. All the same, I’d say Prof. David Anthony shows that a more grown up anthropology is still possible, and I’m really grateful for the system of gift exchange, flourishing within our modern economy, which led to my now grown up daughter giving me this book. Cultural relativism is the principle that an individual human’s beliefs and activities should be understood by others in terms of that individual’s own culture. For me, there’s either a contradiction here, or a denial that criticising others can be professional, or it requires some arbitrary separation between whatever you criticise someone else for and whatever amounts to their civilisation. So Boas and David Anthony criticise the obnoxious early 20th century US racist Madison Grant, but couldn’t his views be seen as just an aspect of the civilisation in which he lived? Rather, I think anthropologists – and all of – have to recognise ourselves as part of a culture, be prepared reason through what ways it may be better or worse than other culture, and if worse, do something about it. A current example is the cultural practice in areas affected by Ebola of washing the bodies of the dead – which people there are now able to recognise as not such a great idea, and are accordingly modifying it. In the case of Boas and David Anthony, I would say, there is a commitment to looking at all relevant evidence, combined, I’d guess, with a commitment to some underlying equality between all humans. I’m projecting my own Enlightenment values here of course, which I also think of as part of my civilisation. But provisionally at least I’d say these values also amount to moral truths, and given a civilisation where truth was only to be sought in some ancient text, rather than the archaeological record, then I’d say that was not so great.